Bring the kids along to KL Bird Park and Canyoning & Rappelling Tours. Plan for a day of cool, family-friendly fun on the 6th (Sat) at Sunway Lagoon. 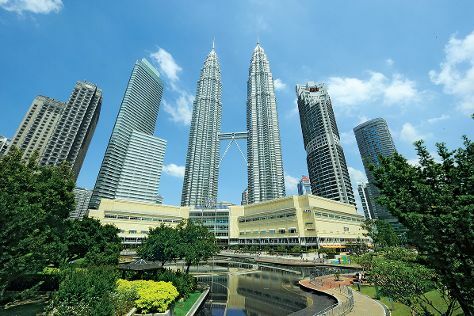 There's lots more to do: admire the striking features of Petronas Twin Towers, admire the masterpieces at Islamic Arts Museum Malaysia, Head underground at Batu Caves, and meet the residents at Aquaria KLCC. For where to stay, maps, photos, and tourist information, refer to the Kuala Lumpur trip itinerary tool . If you are flying in from United Kingdom, the closest major airports are Kuala Lumpur International Airport and Sultan Abdul Aziz Shah International Airport. In April in Kuala Lumpur, expect temperatures between 39°C during the day and 29°C at night. Wrap up your sightseeing on the 8th (Mon) early enough to travel back home.